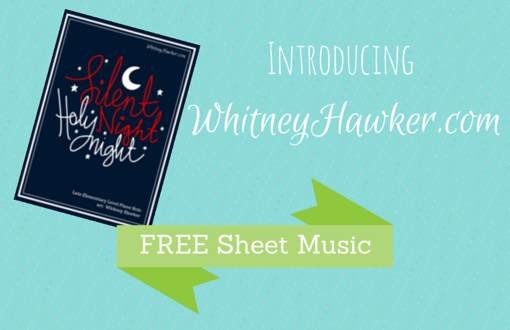 Introducing WhitneyHawker.com – Free Sheet Music! Today I am sharing something big… Something I’ve been working on personally all year. Ready… set… go! I’ve finally started publishing my own music at a new personal domain – WhitneyHawker.com! My amazing web designer has helped me with the look I wanted and after lots of detail work (I had no idea how much goes into each product page from mp3 files to certain images sizes), we launched in beta mode to friends & family. Now we’ve worked out everything in the system and I’m proud to launch it full scale! After years of writing pieces for my students, I’m hoping to share my music with other students outside of my own studio. Composition has always been a creative outlet for me as I’ve pursued my piano degrees. I’ve taken private lessons and won several competitions over the years but slowly, I realized I loved composing for my students more than just for myself. Many of the compositions are ensembles – I believe in the power of motivation through duets, trios, and quartets at the piano. My students always ask for more and each summer, my studio hosts an entire summer camp full of ensemble music – it’s so much fun to play with friends! If you have a certain type of piece or arrangement you’d like to see, I’d love ideas for new compositions! Anyways, enough talking from me so please go check it out! For December only, I will be sending you a free late elementary Christmas sheet music when you sign up for the mailing list. And I promise not to send too many emails – really just a few times a month! The blog has several free teaching worksheets & activities that go along with pieces. I’m so excited to share all of my compositions and ideas that go with them so I hope you find something you like. We’ll be adding new pieces often so please check back! Christmas Recital Program - Free Printable! I would like to sign up for your mailing list. I have really enjoyed your website and the resources you have shared. I’m looking forward to your sheet music! Oh thank you Geri! I will add your email address to the list and you should receive an email with the sheet music. Hope you enjoy it! Email sent – let me know if you don’t get it! Thanks for your interest! I would love to join your website and hear about your music – Can you please add me to the list also? Thanks! You’re added to the list! Thanks Belinda! Thanks for this improv idea. Cant wait to use it for both my private students and group lessons at our local high school!